The San Diego State guard struggled adjusting to the NBA line with his flat jump shot, which is surprising after how well he shot the ball at the NBA Combine last week. He did, however, prove capable in the mid-range and dropped in a floater or two. Thames struggled to get by his man consistently due to his underwhelming first step, forcing him to settle for contested jump shots. 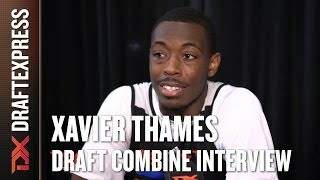 Thames is likely a better player than he was able to show here.